Ms. Lwin’s photograph was taken by FED staff members while she stayed at the Phang Nga Shelter at which time she gave verbal consent to be photographed. Ms. Lwin is a 27-year old woman from Myanmar. She searched for an opportunity to go abroad to Thailand due to financial and personal problems in Myanmar. 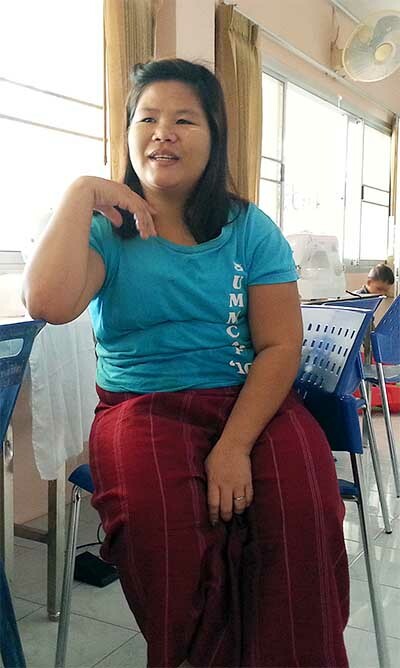 She was smuggled to Thailand by a broker agency and employed at a factory without identification documents. Later she became dissatisfied by the experience and again contacted other brokers and changed work multiple times moving between several rubber plantations throughout Phang Nga province. The final broker she connected with sold her to a rubber plantation owner for 12,000 Thai baht. The conditions were worse than before as she was forced to work long hours and the owner refused to pay any wages. The plantation was remote and impossible to get away from without assistance. Fortunately, Ms. Lwin met an FED community leader in the area who gave her contact information for FED’s Trafficking Hotline 06 297 810 09. She was able to call the Hotline and seek help from FED. The next day, FED conducted a rescue mission and helped her gain her freedom. FED housed Ms Lwin at a staff member’s home for one night and interviewed her extensively about her experience as well as counseled her about her legal rights and options. The following day, FED took her to the Phang Nga Women and Children Shelter. She received housing and care at the shelter for 10 days, however the shelter disagreed with her situation being a human trafficking case. The shelter official’s said she was instead an undocumented migrant. FED then negotiated with Thai immigration, the Department of Human Resources and Development, and Myanmar Police Force to arrange and allow her safe return to Myanmar without being detained or arrested. FED later contacted Ms. Lwin to make she had arrived home safely. Ms Lwin was home with her child after 8 months in exploitative situations and grateful to FED for its support and assistance in helping her achieve her freedom.